Bomb Threats Across the U.S. The Bomb/Arson Tracking System (BATS) is the national repository for arson and explosive related incidents reported to the United States Bomb Data Center (USBDC) from law enforcement/ public safety agencies. 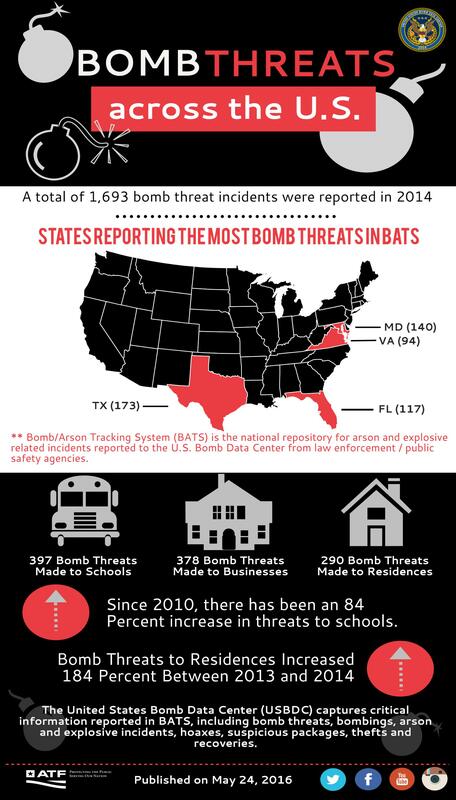 States reporting the most bomb threats in BATS are Texas (173), Maryland (140), Florida (117), and Virginia (94). 397 bomb threats made to schools. 378 bomb threats to businesses. 290 bomb threats made to residences. Since 2010, there has been an 84% increase in threats to schools. Bomb threats to residences have increased 84% between 2013 and 2014. The USBDC captures critical information reported in BATS, including bomb threats, bombings, arson and explosive incidents, hoaxes, suspicious packages, theft and recoveries.